Do you like impossible-to-pull-off heists? Do you like characters you’ll never forget? Do you like endings that make you gasp? 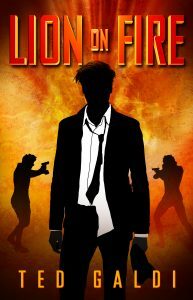 Then you’ll love Lion on Fire, the third novel by Ted Galdi, an Amazon #1 bestselling author who’s won Reader Views and Readers’ Favorite awards, and been featured by FOX, ABC, and iHeartRadio. Get your copy of this hit book today and plunge inside New York’s underworld with two unlikely criminals who’ll have you cheering for the robbers instead of the cops. Ted Galdi, an Amazon #1 bestselling author, has been featured by Kirkus magazine, ABC, FOX, iHeartRadio, and many other media outlets. He’s a winner of a Reader Views Reviewers Choice Award and a Silver Medal in the Readers' Favorite Book Awards. Ted is a graduate of Duke University. His available releases are the books Elixir, An American Cage, and Lion on Fire, and the short stories A Road to Nowhere and Hazel Is Missing.